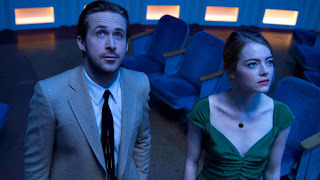 La La Land. Los Angeles. Hollywood. In its heyday, the musical was the thing. Big, bold productions filled huge sound stages and were chock full of talented vocalists and dancers; experts in their craft. Musicals on film were cranked out, one after the other, many to become classics like An American in Paris or Singing in the Rain. The trend continued on into the sixties with the likes of West Side Story and Hello Dolly. But a time came when film versions died off and the musical lived on elsewhere, relegated to tiny Broadway stages. But Hollywood loves Hollywood and the vehicle that is La La Land comes to us heavily hyped, heavily lauded and highly anticipated; loaded with expectations. Does it live up to the hype? Not so sure. Prepare yourself for a wonderful, fresh new score by Justin Hurwitz who collaborated with director and writer Damien Chazelle on this film as well as the tour de force Whiplash. Laced with song and dance numbers, big production pieces such as the opener "Traffic", and smokey, hazy jazz interludes throughout, the music is the stitching in the fabric of the film. But the fabric itself is a bit bland. Color is all throughout the production but the basic storyline has been done so many times in far too many ways. Struggling actress/ barista Mia (Emma Stone) trying to make her way away from home, not the Midwest this time but Nevada, to try making it big as an actress. She crosses paths a few times with Sebastian (Ryan Gosling), a jazz aficionado who longs to open his own jazz club in a time where jazz is dying. He makes ends meet by playing meaningless gigs around town. Mia auditions and flops through a chain of auditions and performances while Sebastian begins to stretch his legs with a new band gaining popularity but not really playing the the kind of stuff he is passionate about, in order to pay the bills. Their budding relationship and year long courtship waxes and wanes through the less interesting midsection of the film, until their professional courses diverge and related demands begin to threaten to divide them. The paths they take and the expression of the driving forces behind them are when the movie seriously and finally become the most interesting and complex. The singing and dancing talents of our real stars are pleasant enough but they do not completely impress. The characters are charming but remain flat through most of the storyline until conflict and personal drive force choices in each of them. Is there enough love and commitment to their relationship to support both through their personal goals in and out of La La Land? There is plenty of "La La" or altered reality states via dream sequences such as the one at the observatory following a screening of "Rebel Without a Cause". Cinematography sparkles and shines, through creative camerawork and there are certainly worthwhile visual moments. But one really senses a big lull in the rather thin and predictable storyline. The chemistry between Stone and Gosling was much stronger and more electric in 2011's Crazy, Stupid, Love. And there are sluggish 50's undertones that don't translate well into the current day City of Angels. Stone seems to be attempting to stretch her performance skills much, since her early start as a more comedic actress, followed by some romantic-comedic roles , then most recently dramatic parts and now attempting the triple threat with some degree of success. Gosling is like able enough but should stick to the piano, and let the keys do his dancing and singing for him. Award nominations are pouring in left and right for this piece and it is really really trying to resurrect the classic Hollywood musical. L.A. , Itself, has not looked this good in a long time on screen. But great sound and pretty cinematography, with skilled editing, will not hide a thinly veiled script of minimal substance and two actors trying their best to become professional singers and dancers in Hollywood's own love letter to itself. It will most likely win many of those awards but are they deserved? Perhaps if only for the ambitious attempt to resurrect a great genre and pave the way for more to come in the future. L.A. Can bring them on and hopefully build better storylines into the next ones.